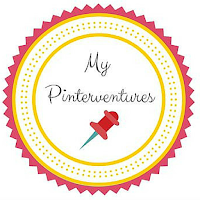 My Pinterventures where I share all things creative. This is my first-time guest posting, ever! I'm slightly nervous, but even more excited for the opportunity to be sharing on Crafty Allie's blog! A few week's ago, I hosted the 2015 Ornament Exchange and ended up with two exchange partners. It was a bit of a challenge because both of my partners had such different tree themes. I created and shared a Coastal Glitter Starfish Ornament on the blog, but never had a chance to share the second ornament. So today, I'm sharing the second ornament, a DIY Rustic Christmas Tree Ornament that I sent to my second exchange partner. 1. Paint stain onto the wood Christmas tree. Wipe off excess and let dry. 2. Dry brush white paint over stained wooden tree. Let Dry. 3. Paint wood star yellow and let dry. This is optional - paint Mod Podge on the star and sprinkle clear glitter on it. Set aside. 4.Cut and knot the ends of three twine garlands. Glue onto the tree and let dry. 5. Cut snowflakes from the ribbon. Glue onto various spots. 6. Glue mini buttons onto various spots. 7. Make a mini bow and glue to the trunk of the tree. Glue star onto the top of the tree. All done! Now all you have to do is hang it on your tree! Thank you Allie for letting me share on your blog today. I hope everyone enjoyed this easy holiday craft and has a happy crafting holiday season! Beautiful, and so easy to make! I love that rustic look! Really cute! This is such a cute ornament!!! Pinning! I bet my daughter would love to make a few of these this Christmas.